Spirit spacecraft hits planet's surface, but is it working? 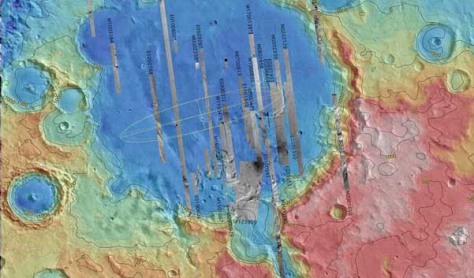 An image of Gusev Crater, the landing site for NASA's Spirit rover, is color-coded to show altitude. The projected landing area is indicated by the faint outline of an ellipse. A canyon called Ma'adim Valles is connected to the crater at the bottom of the image. Scientists believe Gusev Crater may have been an ancient lakebed.